Sony VAIO VGN-AR190G Blu-Ray enabled digital studio notebook PC is a powerful, portable multimedia and entertainment media center PC plus the first laptop computer to include high-definition Blu-Ray DVD playback capability, which is backwards-compatible with standard DVDs and CDs and is also a multi-format disc burner to write DVD+/-R/RW discs as well as dual-layer discs. 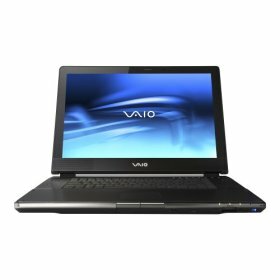 Sony VAIO VGN-AR190G features Intel Core Duo T2500 processor, 17-inch WXGA+ (1440 x 900 pixels–ready for 1080i HDTV) widescreen LCD with XBRITE technology, NVidia GeForce Go 7600GT graphics card with 256 MB of video RAM, 802.11a/b/g Wi-Fi, memory card reader, Bluetooth wireless connectivity, ExpressCard/54 card slot and NTSC TV tuner and runs Windows XP Media Center 2005, Update Rollup 2. PC Magazine reviews Sony VAIO VGN-AR190G digital studio laptop and concludes good editors’ rating of 3.5 out of 5 that the VAIO VGN-AR190G is Sony’s best portable Media Center offering so far, but it’ll put a large dent in your wallet. Because of its HD recording capabilities and other promising A/V features, this attractive laptop is a bit more compelling than the Qosmio G35-AV650. That said, my suggestion is to delay taking the plunge until Sony hammers out several software issues and more Blu-ray titles hit the shelves. Laptop Magazine (dead link) reviews Sony Blu-Ray notebook and compares it with Toshiba Qosmio G35-AV650 that which HD-DVD enable, and concludes that if you’re chomping at the bit to start watching, editing, and burning HD video, the Sony VAIO VGN-AR190G delivers the goods. If your hedging between this Blu-Ray system and the HD-DVD-enabled Toshiba Qosmio G35-AV650, the Sony gets points for its lighter, sleeker design (8.4 pounds versus 10.1 pounds), better graphics scores, and, of course, the fact that the VAIO’s Blu-ray drive can write as well as read discs. However, these advantages don’t quite justify the $500 delta between the Toshiba and Sony.